Hackshaw Ridge is now showing in cinemas everywhere and is distributed in Australia by Icon Film Distribution. Mel Gibson's Hacksaw Ridge is frightfully graphic, violent and confronting, but ultimately life-changing in the most beautiful of ways and an absolute triumph in filmmaking. 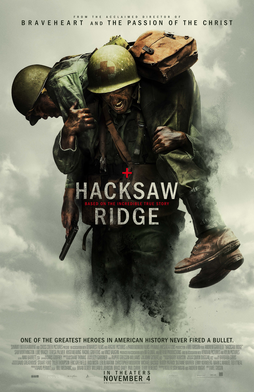 Hacksaw Ridge is the story of the unlikely American World War II hero, medic Desmond Doss (brilliantly poratrayed by Andrew Garfield). Doss was a man, who because of his strong religious beliefs, refused to carry firearms during the war much to the disgrace of his superiors and fellow soldiers. However, despite being unarmed he was able to single-handedly save 75 men during the Battle of Okinawa and become the first Conscientious Objector to be awarded the Medal of Honour. The story of Desmond Doss is truly incredible in itself, but the screenplay written by Robert Schenkken and Andrew Knight along with Andrew Garfield's inspired performance give greater depth, understanding and respect to the character and his heroics. Doss was not a traditional war hero by any means in that he would not go into war with any type of weapon because as a Seventh Day Adventist he believed that thou shalt not kill. It is a beautiful thing how strong in his faith Doss was and how his faith was what gave him the strength to carry all the men he saved to safety on his own. The understanding of his character and his beliefs are strengthened for us in the way the film shows us his past and the events leading up to his enlistment. The superb character development allows one to feel close to and empathize with Doss and whether you agree with his beliefs or not, you still understand and respect them which is a thought that is more than relevant in everyday life. 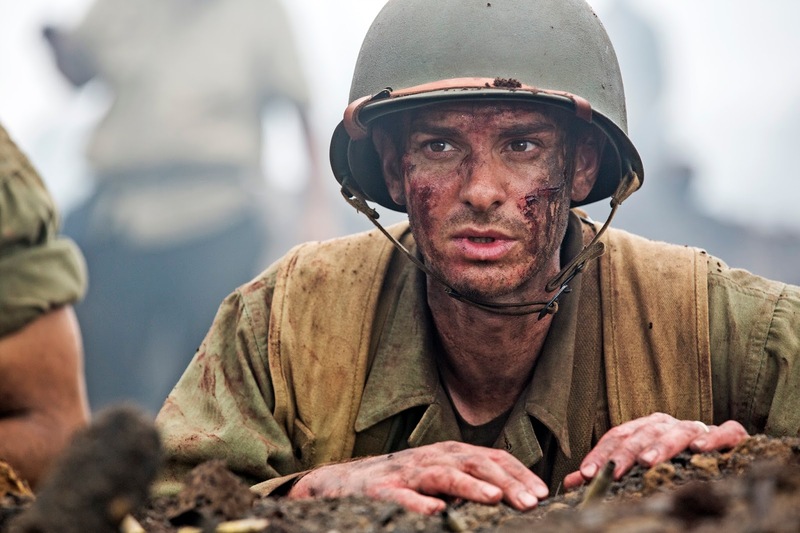 Andrew Garfield completely shines as Doss and is so far the role of his career. He gives a performance which is wonderfully restrained in the right parts and is incredibly moving and intense when it also should be. He completely embodies the role of Doss and makes him likable, relatable and into the hero who always has the audience on his side wanting to cheer for him. While it is loving towards the character of Desmond Doss, Hacksaw Ridge is still an astonishingly brutal, but realistic piece of war cinema. The Battle of Okinawa is terrifying in every sense of the word as it is accompanied by a sense of dread and suspense formed by the horrifyingly graphic visuals and the implication of sudden and random bloody death. It requires a great amount of will power not to look away at all throughout the final third of the film as it is so incredibly confronting and graphic. It is hard to call any of these visuals anything pleasant, but the cinematography by Simon Duggan is truly exquisite. From the opening scene, the film is beautifully shot and entrancing with it's slow motion shots and spectacular war-torn landscapes. Despite it's hard edge, Hacksaw Ridge is also rather romantic thanks to the beautiful chemistry between Garfield and Teresa Palmer, who plays Doss' wife, Dorothea. The two resonate whenever they are on screen together and it is the type of old-fashioned love many people only dream about now. Hacksaw Ridge is also a career high for Palmer, as it is to date the best performance of her career. Just like Garfield, she is likable and incredibly sweet and sensitive. Hugo Weaving and Rachel Griffiths, who play Tom and Bertha Doss also give tremendous performances. Hacksaw Ridge is the best war film to have been released in years. It is gritty, unforgiving and relentless, but at the same time inspirational, moving and entrancing.